While the DC Extended Universe is setting themselves up to stand apart from Marvel, there are a few things that we can expect to see since the continuity filled cinematic universe has been built once before. In addition to expecting those major crossover events, we can also look forward to minor characters popping up in the various upcoming films. After all, if all of these films take place in the same universe, then they share many things in common, like government officials for example. Or more specifically, the President of the United States. You just might! … That is a house of cards. That is one with a lot of story strains and story plot. Whether you go work in DC or go work at Marvel, the sandbox is kind of established and you kind of have to play within the sandbox. The key is to, hopefully, when you’re in the sandbox, to create your own castle. While the big hero crossovers, like we got in Batman v Superman: Dawn of Justice are great spectacle moments, it’s the little cameos that tend to make the greater world feel more real. Seeing these characters in different situations, interacting with new people, make them seem like people who are living normal lives. Certainly, if James Wan’s script requires the President of the United States, we would fully expect Patrick Wilson to be the one playing that role. Considering the two have worked on both Conjuring movies together, it wouldn’t be surprising if Wan made sure there was a little something for his colleague to do. Of course, as the Aquaman movie will follow the first part of Justice League, the DC universe will be a much larger place by the time Jason Momoa gets his opportunity to shine in a leading role. There will be numerous new characters, both big and small, who could be making appearances in this movie, or any of the others. Which got us thinking. 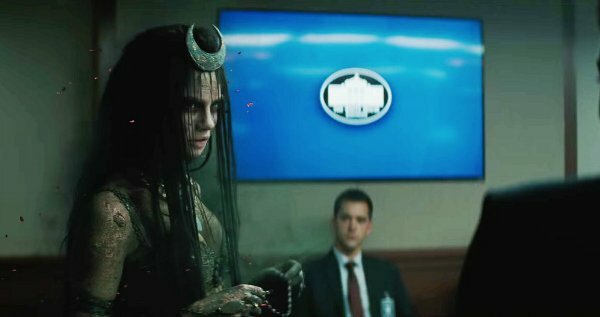 Who do you think Enchantress is speaking with in this Suicide Squad photo? She appears to be in a government office. Might Patrick Wilson play the President in David Ayer's movie, too? How would you like to see Patrick Wilson’s President become part of Aquaman? What other aspects of the DC universe would you like to see make an appearance? Let us know in the comments.